Bali, the Island of Gods. Not exactly the road less travelled, nor is it undiscovered, but this slice of paradise has yet more to offer than meets the eye (or your generic Google search). It has been a month and a half since I set foot on Bali for the first time and now, having explored some of its most well-known and least well-known corners, I still feel like I’ve barely scratched the surface. It’s a magical place, with a tourist industry so fantastically developed to accommodate your every Western whim, yet with spirituality and hidden treasure troves that will make you feel like you could well be the first foreign human to have ever explored them. Below is a list of 5 of Bali’s best kept secrets. Amed was a name I first heard from an adventurous solo lady traveller whom I met in Ubud. “Ubud is great”, she explained, “but Amed is where you’ll find true Balinese authenticity”. An Uber driver elaborated further: “Amed is what Kuta (the tourist epicenter of Bali) and Canggu (the up-and-coming tourist epicenter of Bali) used to be some 20+ years ago”. Laid-back, slow-paced, peaceful and uniquely picturesque, Amed is the antidote to the over-touristed Balinese south-west coast. A place where up until 2000 there was no tarmac on the roads, with telephone lines being installed for the very first time in 2003. Amed is known as the perfect getaway for divers and wanna-be divers, as the waters off its coast are perfect for deep underwater adventures, and the stores lining its shore can help and equip you with everything you need to get started. If you’re venturing out beyond the seaside, you will most likely like to engage in an activity that I imagine the locals must find rather peculiar – Rice Terrace Watching. For many of us who have never ever seen them, they are spectacularly mesmerizing. 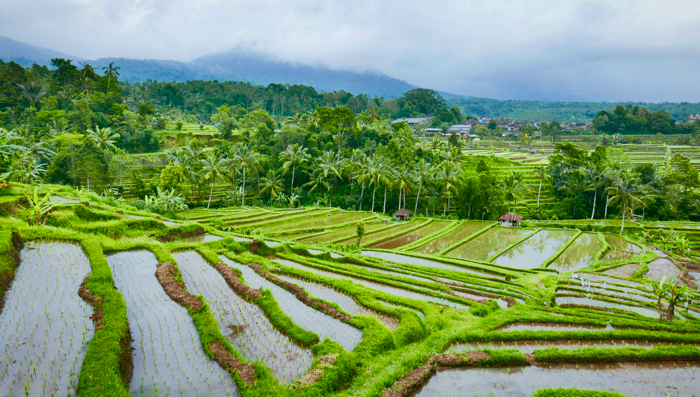 Many of the rice fields in Bali are still manually cultivated and harvested, and that makes them all the more wondrous. Perhaps the better known (and closer to popular Ubud) terraces are the ones located at Tegalalang, a mere 30 minutes away from town. Venture a little further, however, and you’ll be in for a real treat. Jatiluwih Rice Terraces are larger, a little less visited, and all around picture-perfect. Add to that a misty mountain backdrop, and you have a truly glorious setting. Batukaru Temple is located another 30 minutes through the rainforest. It’s not as popular as its Holy Springs or other famous counterparts, but its elevated position means less tourists, more misty mountains, and better accessibility (you are welcome to enter, walk around and photograph to your heart’s desire, unless a ceremony is taking place). An intoxicated backpacker I met in Ho Chi Minh City told me about the Gili Islands off the coast of Bali, which is how I got the hunch that I’d never want to go there. In Bali I learned that the Gili Islands are a party enclave where the young and wild go for a good few nights out. Gili Meno, however, seems to have inadvertently remained practically untouched. 400 locals call this very small island home, and are blessed with its pristine beaches, fringed palm trees, calm waters and beautiful corals. The best reason to visit, however, is the local Turtle Sanctuary where both loggerhead and green sea turtles are safely hatched. For an eco wildlife experience, come here and witness the (turtle) miracle of life. You can release the hatchlings by hand in exchange for a small donation. It’s in the name – need I say more? The village of Sambangan is hidden away in the far north of Bali, at an elevation between some 2500 – 5000 ft; local life is centered around agriculture (more rice terraces!) and villagers work together as part of a local cooperative. The Secret Gardens of Sambangan are every nature-adventure-lover’s dream come true: stunning rice fields, lush jungle, and a chain of marvelous waterfalls have given the area its name. There are seven falls in total, and it takes some serious sweating and hard work to reach them. A visit here involves several-hours’ long trek deep through the jungle. The reward? Fresh spring water pools to plunge into and cool off in, as well as naturally created waterslides for the daring. This part of Bali is truly remote and unspoiled, and the scenery here is some of the most spectacular on the island. Back seaside, Lovina is another polar opposite to Bali’s most popular beach locations. Low-key is the keyword here, as the north-east gains in popularity and locations like Sanur and Candidasa become more popular, Lovina – simply based on its northernly location – is still lesser known and more secluded than most. A pristine beach, and several snorkeling and diving locations within easy reach, are not the only attractions here. Come to the Brahmavihara-Arama – one of the few Buddhist monasteries on the entire island – for some splendid cultural exploration; or head for the beaches – not just to bathe, but to observe the myriad of fishing boats going about their daily business. Sea life is more abundant here, with dolphin watching attracting the fewer tourists who venture this far out. For a more spiritual experience, you can head to Banjar Hot Springs located amidst green hilly slopes and tropical gardens, to wash away your sins (as they say). ps: we at allé love Bali so much we’ve even created a signature travel plan for it! Also be sure to check out the quick guide to visiting Bali.